This superb The Last Supper V - da Vinci Italian wall tapestry is based on the famous 15th century painting by Leonardo da Vinci. Here in the Last Supper we see Jesus and disciples final meal before his crucifixion. It was thought to be commissioned by Leonardo's patron Ludovico Sforza, Duke of Milan. The famous piece is capturing the reaction of Christ's disciples when he announces that one of them will betray him. Judas is seen clutching a small bag presumed to be the silver given to him to betray Jesus. There are many references to the number three in this piece, a symbol of the Trinity such as groupings of disciples into threes, and Jesus' figure as a triangle. 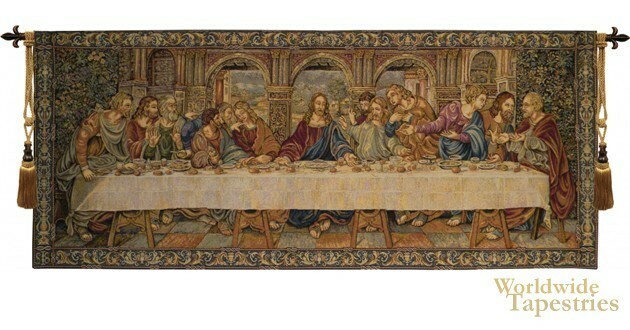 This Renaissance tapestry The Last Supper is backed with a lining and a tunnel for easy hanging. Note: tapestry rods and tassels, where pictured, are not included in the price. Dimensions: W 62" x H 26"